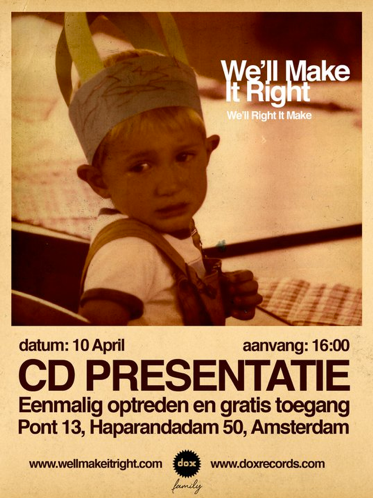 Sunday the 10th of April, We’ll Make It Right will play their only live show ever. In the relaxing, sunny atmosphere of Pont13, you will have one chance to see this band perform the songs of their new album We’ll Right It Make live on stage, and I suggest you grab that chance. It’s a common story: tormented musicians locking themselves away in a remote cabin for as long as it takes them to find their true inner self and express it through music. It’s what made Bon Iver’s album the classic beauty it is, and what Friendly Fires have done for their about-to-be-released album Pala. In November 2010, an all-star group of musicians from the Amsterdam based alternative pop jazz label Dox Records decided it would be a fun idea to do the same, and lock themselves up in a cabin in the Ardennes to record a couple of songs. However, fuelled by an overdose of creative energy, they ended up creating a full-length album. From refreshing disco-pop to moody jazz to bouncing indie-funk, the We’ll Make It Right album clearly is a collaboration of different artists, but the overall vibe is wonderfully quirky and high in energy. It’s a refreshing sound that will define the Spring of 2011. With the wide variety of instruments used, and the people playing them changing around each song, this band would be a joy to see live. And like I said, you have one chance, else it’s only hoping that they’ll come back for another album. Furthermore, we have the pleasure to give out 3 fresh copies of the brand-new album to three lucky readers. Let us know on Facebook what your favourite WMIR video is to get a chance to win, so you can keep enjoying their sunny tunes long after the gig.